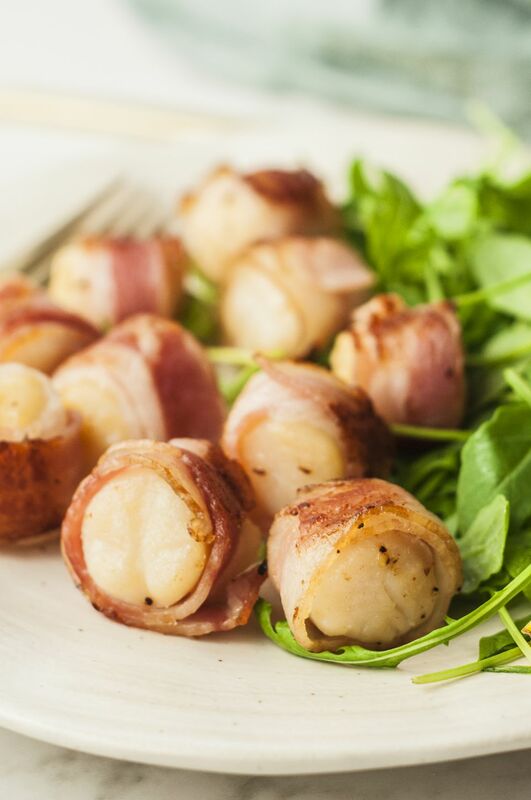 This combination of scallops and bacon is a snap to prepare, and the presentation is impressive. Just wrap partially cooked bacon around a scallop, season, and then broil for a few minutes. You'll have a tasty, elegant appetizer your guests will love. The recipe may also be fixed with large or jumbo shrimp. Cook bacon gently until partially cooked but not crisp and still flexible. Rinse scallops under running cold water, pat dry with paper towels. If you notice any tag-like pieces on the side of the scallops, this is a tough muscle and should be removed. Just pinch it with your fingers to remove. Cut each bacon slice crosswise in half; wrap each half around a scallop and secure with a toothpick. Sprinkle scallops lightly with seasoned pepper. Preheat broiler. Place scallops on a rack in broiling pan. Broil 4 to 5 inches from heat for 8 to 10 minutes, or until scallops turn opaque throughout, using tongs to turn scallops frequently so the bacon browns evenly on all sides. Serve as an appetizer or an entrée. You might come across scallops labeled "wet" or "dry." Wet scallops have been soaked in a phosphate bath, which adds plumpness and water. Dry scallops are natural and will not look as white. You might only find wet scallops locally, but if you can choose between the two kinds, choose dry or untreated. Instead of pan frying the bacon, try baking it. Just line a baking pan with parchment or fit it with a rack. Replace the seasoned pepper or lemon pepper with a light sprinkling of Creole or Cajun seasoning or a salt-free seasoning for seafood. Use turkey bacon instead of pork bacon, or choose uncured bacon.